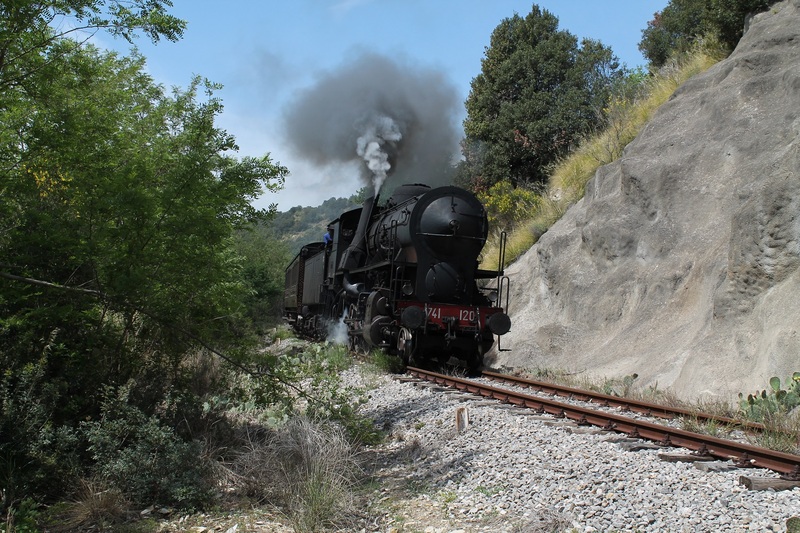 Mark Nicholls steps back in time for a steam train tour across central Italy. The air sits heavy with the gritty aroma of steam; we can hear, and smell, the hefty black locomotive, even sense its presence before we finally set eyes on it. Sitting at the head of a pair of vintage coaches, Italian class 2-6-0 No 640 is at the far end of the platform at Rimini. 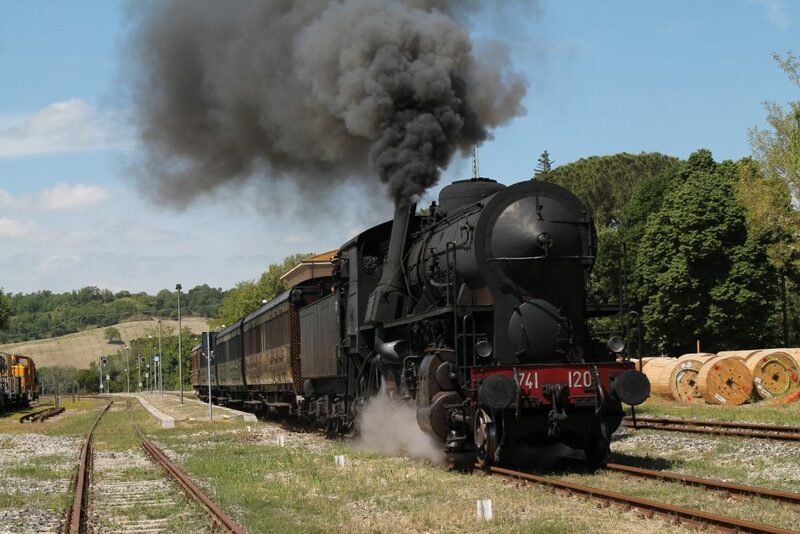 Not only is the air rich with steam and dancing billows of black smoke, there is also a great sense of excitement and anticipation as we embark on the first leg of a seven-day steam train tour across central Italy. Our journey will take in the classic Tuscan cities of Florence, Sienna and Pisa; it will pass along some of the region’s less well-travelled rail routes and offer a new dimension to the landscape; and will also grant us the opportunity to savour classic Italian cuisine and wines as we go. We board the beautifully-restored 1930s Third Class coaches, their varnished seats, curtained windows, neat luggage racks and old engraved prints illustrating the vintage. I can’t help imagine the stories they’ve heard told over the decades. With a piercing shrill of the whistle, the locomotive lets out a plume of smoke followed by an impatient hiss of steam and we are under way, easing out of Rimini station on the country’s east coast: destination Florence. Our loco, built in 1910, drew fast passenger trains in its heyday, and soon settles into a steady beat as we accelerate to 60mph. Poppies, fields of strawberries and vines flank the tracks while we can see rows of olive trees further away on the hillside. We race to Faenza where we branch off onto the single-track Faentina route toward the Tuscan capital, the line sweeping through steeper terrain as we head to Brisighella and pause on a loop to let the oncoming passenger service pass. The gradient forces the locomotive to work hard on a line that was established in 1839 by Grand-duke Leopold of Tuscany to link Italy’s east and west coasts via the Apennines. It remains a stunning feat of engineering with numerous tunnels, viaducts and cuttings and set amid rugged landscape. Marradi looms into view: the loco refreshes with water while we replenish with lunch (bruschetta, pasta, grilled meats and panna cotta) and as we soon discover, extended lunch stops in restaurants near the country halts are a feature of our rail journeys. From Marradi we continue to climb through a series of tunnels until we reach the summit and race down the other side, stopping at small stations where passengers on regular rail services snap us with their mobile phones and wave enthusiastically. 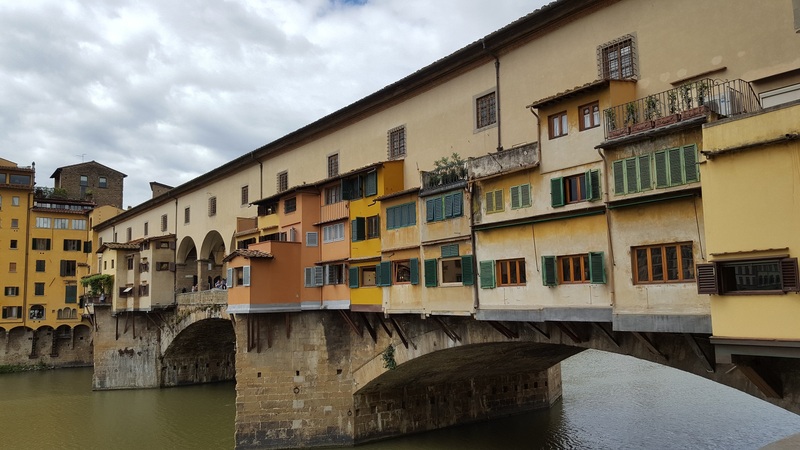 We canter away towards Florence and check into our four-star hotel close to the historic centre, which will be our base for exploring the city of Renaissance. The Tuscan steam odyssey offers us a day to explore galleries, museums, Renaissance art and admire wonderful architecture. We see the Duomo, cross the Ponte Vecchio over the River Arno, and shop in the San Lorenzo Markets. Other attractions include the church of Santa Croce – final resting place of Galileo, Michelangelo, Machiavelli and Dante – and of course the Uffizi Art Gallery and the Galleria dell’Accademia, home to Michelangelo’s David. Our week-long Steam in Tuscany tour is staged by the Norfolk-based Railway Touring Company, which has long experience in organising rail trips across the world and has specially chartered the train for our seven-day excursion. The following morning, we are up and at the station ready to depart at 9am sharp. Our loco may be from a different era, but it still has to dovetail with the modern Italian rail timetable. The next stage takes us from Florence to Sienna with a pause at Poggibonsi to visit the medieval citadel of San Gimignano renowned for its sturdy towers. Once there were more than 70 in this fortified community on the pilgrimage route to Rome but 14 still survive today, offering spectacular views over the Tuscan landscape. From the highest, Torre Grossa, the panorama across Tuscany is breathtaking, offering a 360˚ view over the red-tiled rooftops and towers and then a spectacular vista across the countryside. 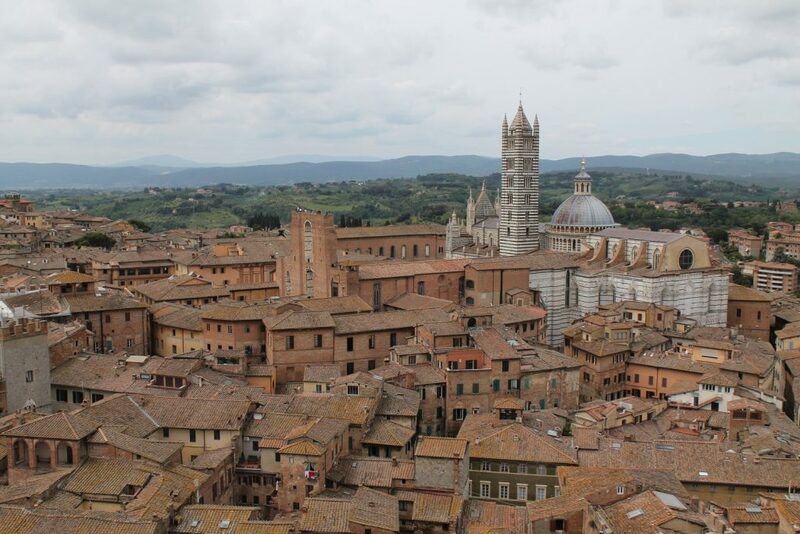 Back in Sienna, we have time to enjoy the red brick city, wander around the Piazza del Campo – which hosts the famous Palio horse race twice a year on July 2 and August 16 – and climb the 400 steps of the Torre del Mangia. From the main shell-shaped piazza, passages fan off in different directions, including up to the Duomo with its impressive façade and black and white striped interiors and treasures within. 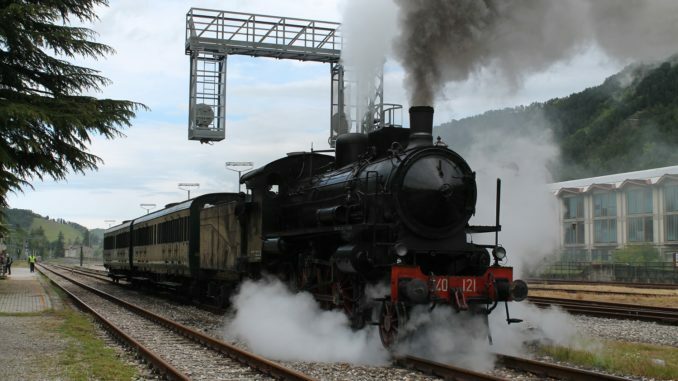 What is so appealing about the Steam in Tuscany tour is the diversity – there is time to explore the famous cities; view the Tuscan landscape from carriage windows; dine in country restaurants; stay in four-star hotels; and above all have the nostalgic thrill of travelling aboard steam-hauled trains. From Sienna, we change engines with the powerful 2-8-0 locomotive 741 and its unique side-stack chimney pulling us to Asciano. Here, we leave the national rail network and head along a single track that has been out of scheduled service since 1994 but is now a well-known route for heritage steam train charters. Bound for Monte Antico, the engine huffs through near-forgotten stations and up a gradient to the summit where we pause, look down on a steep gorge, and proceed. 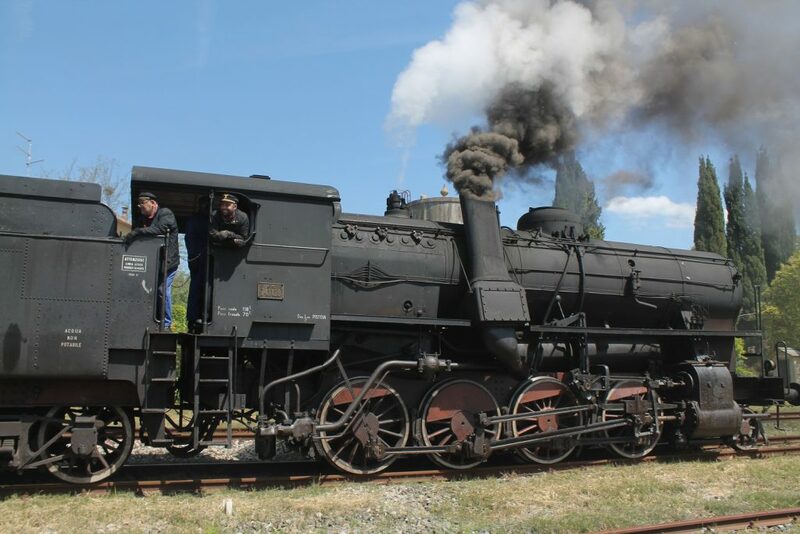 It is also a route which offers passengers the chance of an exhilarating ride on the footplate and experience the full speed and power of the locomotive. As the firebox doors slide open and the fireman heaves shovels of coal into the boiler, you can feel the blast of heat as we speed on through the lonely, lovely Tuscan countryside. 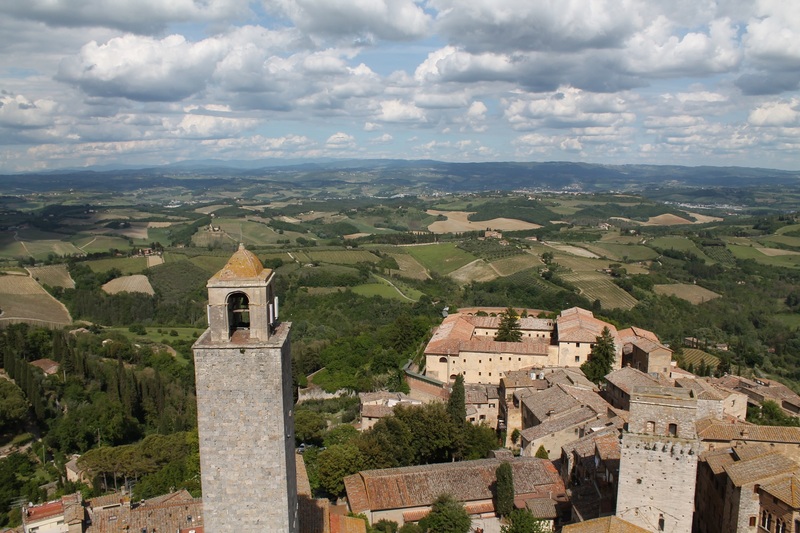 Passing Monte Amiato and San Angelo Cinigiano, we draw into Monte Antico where 741 nips around the carriages, takes on water and then powers back to Torrenieri-Montalcino for lunch – five courses and wine in a restaurant near the station – before we return to Sienna. En route, we detour to Pistoia, the home engine shed of the locomotives hauling us around the region. 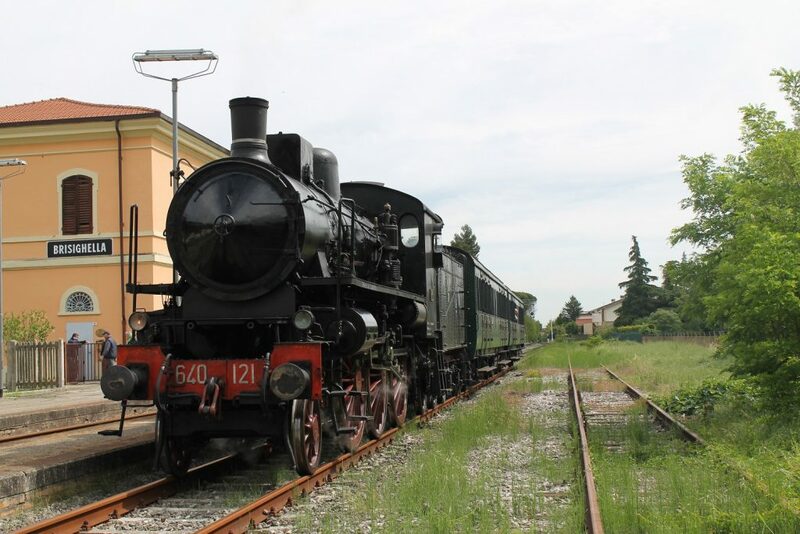 Pistoia is the beating heart of Italy’s heritage steam renaissance and has the support of Ferrovie dello Stato (FS), with the state railway company having a dedicated department overseeing steam services and providing crews and maintenance of the locomotives. Pisa is our final base; time to explore the city and marvel at the leaning tower. From here, we travel to Lucca and catch our train – this time hauled by a rare 2-6-2 passenger locomotive – for a journey through the Tuscan Hills to the Mediterranean port of La Spezia. 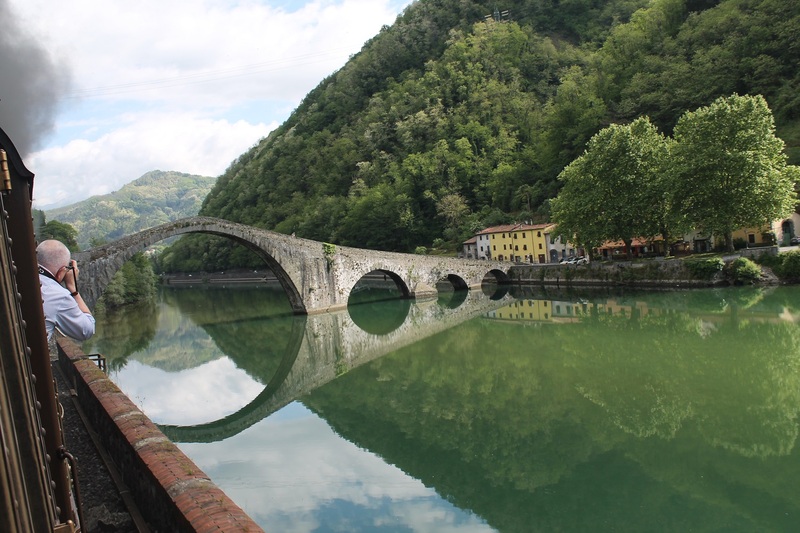 The track negotiates viaducts, ancient bridges, gorges, sweeps through cuttings sided by rocky hillsides, passes mall villages and dives into long tunnels in what is one of the rainiest parts of Italy, keeping the rivers full and the landscape green and fertile. But today, the sun is shining. We flash through more small stations, into Liguria, and finally La Spezia Centrale before making a high-speed return to Pisa on a grand finale of a thrilling steam train tour of Tuscany. Mark Nicholls travelled with the Railway Touring Company on a week-long Steam in Tuscany tour (£2,295 per person) staying in four star hotels and with meals and flights included. 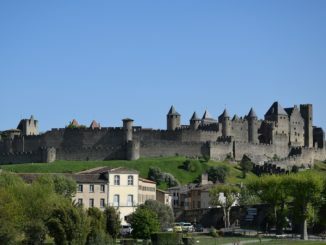 The Railway Touring Company offers a range of heritage rail-based holidays exploring Italy, the UK, Europe and many other destinations across the world. Departing on September 22 for 11 days is the Slovenia, Italy and the Dolomites Steam Express, from £2,760, in a journey from Lake Bled to Venice and Verona while further tours planned for next year in Italy include Steam in Sicily (March 2018), Steam in Tuscany (April 2018) and Southern Italy (Sept/Oct 2018). Other departures of interest include the nine-day Christmas Markets of Bavaria, Switzerland and Austria trip from £1,870 departing December 9, while in February there is the chance to explore the island of Sri Lanka aboard The Viceroy Special. 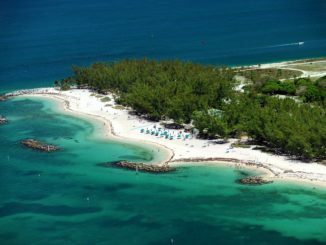 The 13-day adventure departs on February 17, travelling across scenic hill country hauled by British-built Edwardian steam locomotives and costs from £4,450. Mark Nicholls is an award-winning freelance travel writer and author, based in the UK and has written for a range of national titles, specialist magazines and international websites and operated as a war correspondent in locations such as Iraq and Afghanistan.